Burnout Girl (also known as Jennifer, Christy, and other names, see below) is one of the numerous backgrounders that appeared in Daria. She has long blonde hair which tends to fall over the right side of her face. Her typical outfit consists of a black t-shirt, a pendant necklace, a jacket with various patches on the back and upper arms, heavy black shoes or boots, and a pair of olive drab pants with a torn knee and an embroidered flower. Burnout Girl's default facial expression is bland and disinterested. Despite the occasional outburst (such as raising her arms and cheering for Bing and the Spatula Man), most of her emotional displays are subdued and she appears to be rather introverted. Initial designs for her date back to the early pre-production of Daria, though whether she was meant to be a proper supporting character in the early days is unknown. 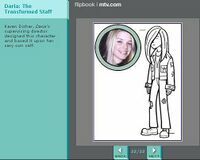 The MTV "Before They Were Daria Stars" flipbook says she "evolved into a different character" but doesn't explain which character. The "Oh, the Obscurity!" flipbook says "supervising director Karen Disher designed this character and based it upon her very own self. 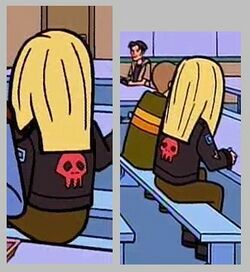 "Burnout Girl" appeared in the original Daria pilot and is often seen roaming the halls of Lawndale High, lost in thought, much like Karen." From the MTV flipbook, Burnout Girl and her designer, Karen Disher. Burnout Girl appeared frequently in the background of the series, showing up from the beginning all the way to the end. She was one of the few students to attend self-esteem class with Daria and Jane, and is in several other classes with them as well, indicating that she is in the same grade as they are. In a number of episodes, she can be seen hanging out with or around Shaggy, from which it can be inferred that the two may be friends or otherwise know each other. She is a smoker, as evidenced in "Jake of Hearts", where she smoke a cigarette in the high school parking lot while leaning against a blue car. In "Legends of the Mall", during the Rattling Girl of Lawndale segment, a character representing her is shown to be of at least medium popularity within Lawndale High. It's possible that this may hold true within actual continuity, as well, given that the story was populated with direct analogues of Lawndale students. In "Pierce Me", to the side of Axl's shop at Dega Street, you can see Burnout sitting on stairs leading to a 2nd floor door - is that where she lives? "The New Kid" features what may be her most interesting appearance, as it is the only time in the series in which her entire face can be seen and it is her only speaking part that can be heard clearly, though it is only a shriek as she tumbles over the side of a trampoline. (In "Sealed with a Kick", she actually got one line, in which she calls Kevin Thompson a geek after he interrupts a shop class to publicly declare his desire to date Daria, but as the pilot episode, it is generally not considered canon.) Her other two speaking appearances are cheering in "Jake of Hearts" (muffled by other people cheering) and singing in "Daria!" (muffled by other people singing). In "The Lost Girls", a scene in the cafeteria shows that Burnout Girl appears to be friends with Bob and Angel. In fact (based on their positioning) Bob seems to be holding her hand. Could the two be particularly close, or more than friends? One strange appearance is "Antisocial Climbers", where - unique among the other characters - she isn't wearing any special clothes for mountain hiking or winter weather for the field trip, despite the harsh conditions she'd be in. When we see the students shivering from a blizzard in a cabin, Burnout is casually leaning against the wall as if the cold doesn't bother her. Whoa. There's a nod to her in "Monster", when Stacy Rowe wears her clothes to the Fashion Don't costume gala. An early Burnout Girl design from the MTV flipbook, in which her given name is Christy. Named Burnout Girl by MTV, she has nonetheless picked up several other names over the years, some more official than others. "Jennifer" is a typical name given to her in fanon, based on a seating chart shown for Mr. O'Neill's class in "Cafe Disaffecto". 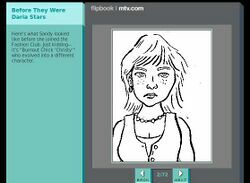 In the MTV flipbook, an early design for her character lists her name as "Christy". She is sometimes called "Karen Disher" or "Karen" after her creator. Other names include "Burnout Chick"; nicknames such as "B.G. ", "K.D. ", "Jen", and "Jenny"; and simply "Burnout". At least two fanfic authors (Jim North and NightGoblyn) have given her the last name "Burns" in their stories.